We pulled out the bikes last night and went on our first family bike ride of the season. I love riding my bike. I'll admit I drag my feet about going because I like to be at home but once I'm on it, I remember why I love it so much. One little hiccup I always have though, is where to put my keys and cell phone. Do you have that problem too? It's just not comfortable having them in my pocket while I ride. So, today I happily solved my problem. I did these little bags start to finish in about 30 minutes. Probably less. 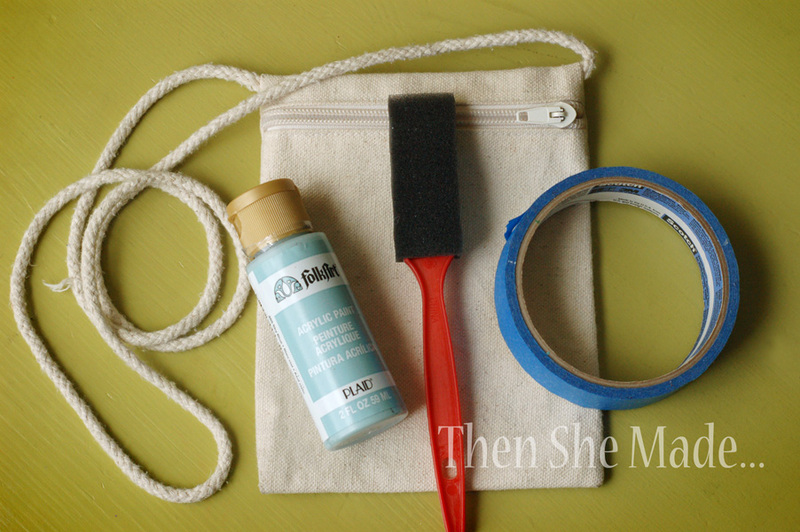 You will need a small canvas zipper bag, paint, painters tape and a paint brush. 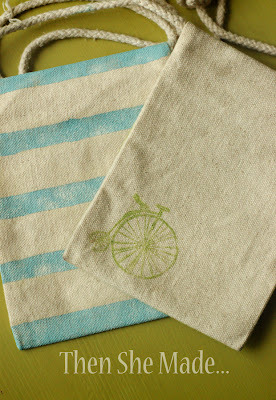 And, for additional optional steps you'll need stamps and a sewing machine. ** Please Note: I didn't use fabric paint. I just used regular craft paint, however, if you plan to wash these, fabric paint would be a better choice. I picked up my bag at Hobby Lobby for about $3. You can get them for even cheaper if you print out a 40% off coupon. Bargain!!! They come in two different sizes, I went for the smaller size. 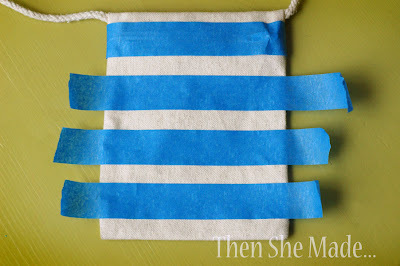 Step 1: Take strips of painters tape and tape them evenly on the front of the bag. Step 2: Wrap the excess tape around the sides and onto the back. Step 3: Then, take more tape and connect the end pieces so you have completed lines on the back, like shown above. 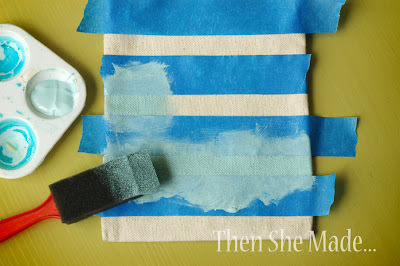 Step 4: Next, take a DRY paint brush - it needs to be dry, don't get it wet first - and paint in between the taped lines. Be careful not to push the paint under the tape. Step 5: When the paint dries, or is mostly dry, carefully remove the tape. You can pretty much do any design you want. I liked the simplicity of the stripes but I also did a checker board pattern as well. My daughter wants to do a chevron design on hers, so really, anything goes. FYI: You can also use stamps on these too - I just painted a stamp with green paint to get the image on the bag above. Technically you could stop there and be done. 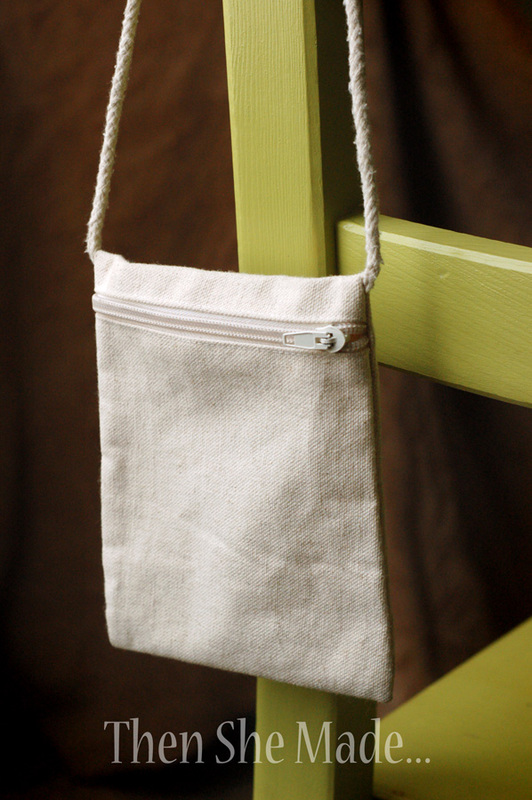 You'd have a small little bag to hold just the basics. 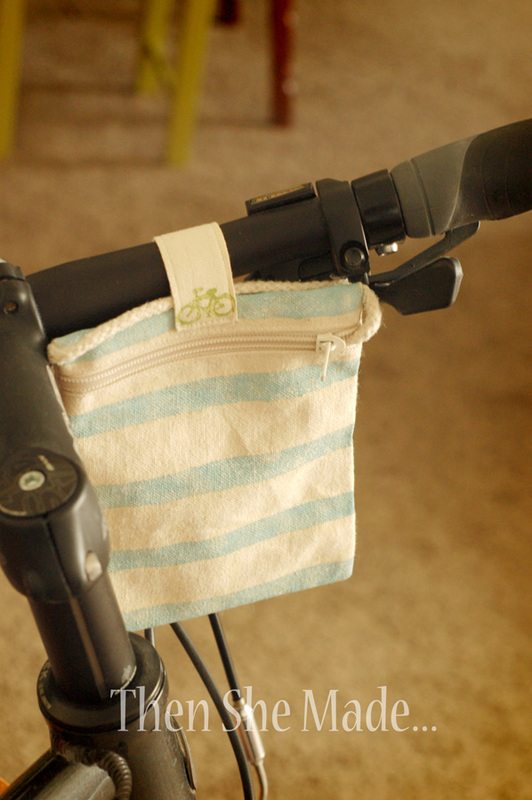 However, if you plan to use it on a bike you'll want to keep reading. Step 6: Take fabric, ribbon, or anything you think will work, and make a strip. I doubled over a piece of canvas-like ribbon for mine. 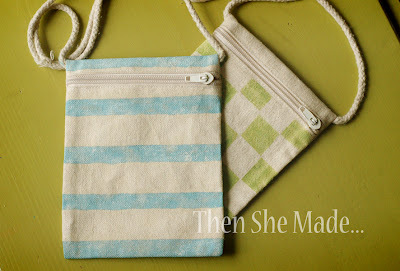 Then, I centered it on the bag and sewed it in place just above the zipper. Step 7: Next, turn the bag over and attach your magnets in place. The best way to do this is to follow the directions on the package. I put my top one so that the back part, the part with the prongs, is sandwiched between the two layers of canvas ribbon. Then I sewed the end of the ribbon closed. For the bottom magnet, I folded the prongs into the inside of the bag. Step 8: Now the only thing to do is attach it to your bike, fill it with your treasures, and head off for a ride. 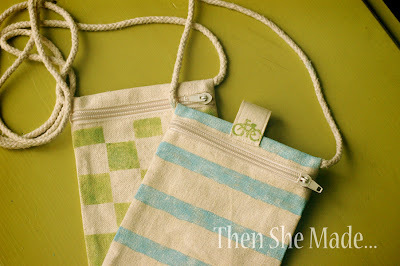 FYI: The little green bike on the strap is actually a little stamp I painted and used - so cute. I'm kind of in love with that little stamp. So cute with the stamping! Now I know that I can use regular hobby-paint. Great tut, thanks so much! You´re welcome to check out my blog. It´s not big but I´m working on it!